Do you find increasing your productivity to be overly complicated? There are plenty of pretty radical ways to maximize your time – both in the office and out of it -, there are also some simpler methods for infusing productivity into your daily life without even thinking about it. Staying healthy and being active are natural ways to increase your overall well-being and improve your productivity. A healthy body and mind help you to overcome mental and physical obstacles that hold you back and decrease your daily productivity. Learning how to sidestep pitfalls like the dreaded afternoon slump or euphoric sugar highs and their notorious crashes will help you to achieve long-term productivity goals without radically changing your work life or forcibly removing coworkers from your office. 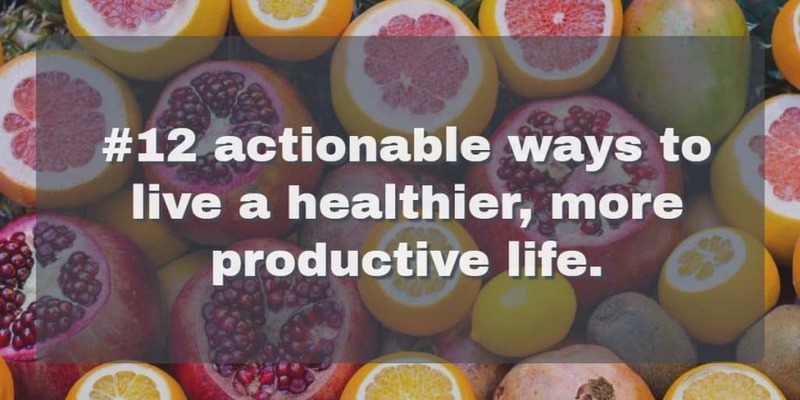 Here are 12 actionable ways to live a healthier, more productive life. Adding more time for physical activity to your day can make a huge difference for your overall health and well-being. Whether you only have time to squeeze in taking the stairs rather than the elevator or the commitment to join a hot yoga studio, getting moving helps many of your body systems to regulate and stay healthy long term. Make Exercise like showering everyday! Getting regular exercise is the most obvious way to get physically active, and it doesn’t have to be a drag! Implement early morning pilates or an evening jog, if that’s what suits you. Or get engaged in something a little more sports-oriented, like joining a softball league. Whether you prefer solo activities or team sports, chances are you can find a local group to join. Or form your city’s first Quidditch team or foot golf club, if you’re feeling particularly motivated. Whatever it is, just get active a few times a week and you’ll lower your blood pressure, lose a little weight, and minimize the damage that comes from sitting at a desk working all day. While you’re at work, take some time away from your desk to get physically active. Use your breaks and lunches as time to explore a nearby park, or even take a stroll around the warehouse, if that’s all you can manage. Even getting up and away from your desk for a micro-break between tasks can jog your mind and help you to feel more refreshed and focused when you return. So choose the farthest water fountain for filling your bottle and enjoy the brief break from your desk. If you have the option, request a standing desk for your work station. Research shows that standing, when done correctly, has the power to reverse many of the negative effects of sitting while working all day. People who stand tend to be more focused and productive. Standing also promotes better circulation and helps to relieve back problems associated with sitting at your desk. In addition to getting physically active, changing up your diet, even slightly, can have a great impact on your overall health and productivity levels. While exercising might get your blood flowing and help you to drop a pant size or two, it’s through diet that you’ll experience the greatest and most long-lasting results of a healthier lifestyle. Now notice we said “diet” and not “dieting”. Dieting – especially trendy and crash diets – can wreak havoc on your well-being. And starvation diets can bring about fatigue and extreme hunger that completely destroys higher cognition and productivity. However, making some changes to your overall diet – like taking one of your daily cups of coffee black, instead of adding cream and sugar – will add up over time. Sugar is one of the great enemies of the productive. While a sugar blast is great at first, the high quickly fades, resulting in a mentally crippling drop in energy that shreds your productivity for at least an hour or two. Limiting quick-acting sugars, like white refined sugar and flour can help you to avoid the sugar crash. When choosing sweets, look for less refined sugar options, like honey, and pair them with longer-lasting fibrous carbs, such as apples, for a more steady energy boost. If you’re like most people, you probably start work early, end it late, and/or have a plate full of other activities and obligations to balance. We get it: you’re busy. You’re tired. You need a little boost each morning and afternoon to get going and get work done. If you’re going to energize, do it wisely. Avoid sugar-laden “energy drinks” that bring a crash far worse than their boost. Limit the amount of coffee that you drink by a cup or two a day to keep from getting to jittery and losing focus. Look for more natural ways to stay energized and focused. There are some teas and plant-based energy supplements that help to bring mental clarity without an unnecessary amount of caffeine and sugar, which helps you to stay motivated and productive, even after your energizer has worn off. Dehydration is a sneaky energy thief, and nearly everyone suffers from it. When you’re dehydrated, it can be challenging to form even the simplest of ideas. Creativity can come to a grinding halt. And you may even suffer from some physical symptoms, like a headache or extreme fatigue. Fighting dehydration is as simple as drinking water. A lot of it. Bring a large reusable water bottle with you to work each day and make sure to drink a whole bottle full by certain times each day. Two bottles in the morning and two in the afternoon should be a great start. Set timers on your phone to remind you to drink, if you have to – proper hydration is just that critical. Plus, getting up and refilling your water bottle is the perfect excuse for a stroll around the office to stretch your legs and your mind. Mindfulness, that is, getting into your own head and understanding how your mind works, is a healthy way to assess your well-being and make course corrections to help you be more productive, focused, and healthier. Contrary to popular belief, mindfulness doesn’t have to be some uncomfortable new age experience. It can be as simple as understanding the way your body feels in any given moment or working through simple relaxation techniques to help you decompress from a stressful situation. Meditation is the practice of taking time to become mindful through deep breathing and focused thinking. Generally, meditation is done in a quiet place, where you’re encouraged to leave your thoughts and stressors behind to engage in deeper breathing and self-awareness. Meditation can spark great creativity by refreshing the mind and clearing your thinking. It can also be a great way to engage with your tight and tired muscles and help yourself to relax before bed or after a particularly busy day. If a half-hour night time routine has you feeling antsy with anticipation of just sitting – or has you green with envy of anyone who has spare minutes to just sit around, you can incorporate meditation and deep breathing exercises into moments throughout your day to stay grounded and focused. Think about relaxing your muscle systems or feeling the sensations of typing on your keyboard for a mere moment before returning to your task. Congratulations! You just meditated. Along with meditation, gentle yoga and/or stretching can help you to relax and unwind after a busy day. Performing a yoga routine in a studio or at home will calm you down and give you an opportunity to work on your flexibility. Many yoga routines even include a time for meditation or chanting that is supposed to deepen the relaxation and rejuvenation that accompanies such a routine. If you’re not comfortable with yoga, or don’t have enough time to dedicate to a daily asana, simply incorporate some simple stretches before you take a shower or go to bed. Loosening stiff muscles from a day at work or commuting will promote better circulation and relaxation. While it may seem counterintuitive to productivity, getting enough sleep is crucial for proper focus and brain activity each day. It might be tempting to burn the midnight oil to finish just one more assignment or dedicate another hour to thinking through a thorny problem, but studies show that going to bed early and getting a full eight hours of sleep is the best way to tackle your to-do list. Do the hours that you sleep make a difference? Yes, they do. It’s better to go to bed early and wake up early than to go to bed late and sleep in. For most people, the morning is a time of clear thinking and focus, so waking up early to take advantage of those hours is important if you want to increase your productivity. Additionally, try to wake at the same time everyday – even on weekends – to maintain your healthy sleep routine.